Forget about the iPhone 5, if you can, for just one moment. The iPhone 4 and 4S are still perfectly valid and relevant choices – honest! If a report over at Mashable.com this week is to be believed, Apple have no immediate plans to release a dock for the iPhone 5 and its brand new “Lightning” design connector. So until a third party manufacturer steps up to the mark with their own docking station design, sticking with the iPhone 4 or 4S seems to be the most prudent move. And don’t worry – technology developers are still coming up with a number of ingenious uses for the older models. Below is a round-up of the handiest and coolest ancillary products that can still be used with the traditional 30 pin connector. See? Not obsolete at all! Whether you’re seeking a sleek, corporate look, prefer retro rotary appeal, or simply want to avoid cheek and ear prints on your iPhone screen, there are a wide range of gorgeous docks that will transform your handset into a desktop phone. Perfect for start-ups and freelancers. 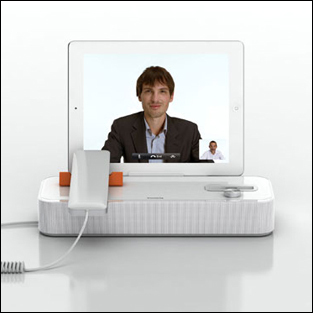 Taking things one step further, the AudiOffice docking station from Invoxia offers low cost video chat by enabling users to access apps like Skype and FaceTime. The unit is compatible with the 30 pin connector iPhone 4 / 4S, iPad and iPod, proving that up and coming businesses don’t need to shell out for the iPhone 5 to enjoy cutting edge gadgetry. Snazzy as they may be, there is no refuting the fact that iPhone batteries are voraciously power hungry. And as there is nothing worse than losing precious battery power while on the go, there are a range of portable battery chargers available, including external power packs that fit into the 30 pin connector. Alternatively there are chargers which fully encase the iPhone, doubling as a cover. Battery cases are available from brands such as Kensington and TeckNet, but the consumer favourite appears to be the Mophie Juice Pack Air, which is more lightweight than other options and almost doubles the iPhone battery life. The Touchfire originated on Kickstarter and is a prime example of the kind of project that arises from the famous crowdfunding platform which really speaks to people. While the touch screen typing functionality of Apple products is incredibly easy to get the hang of, it can be a bit of a strain when composing essays or long emails. Enter the Touchfire, a thin overlay with defined keys, which makes the iPad feel more like a traditional keyboard, and has been praised by The New York Times and Wired Magazine. It makes writing on your iPad incredibly easy, and even enables touch typing, just like on a physical keyboard. If the on-going innovation in iPhone and iPad accessories is anything to go by, it looks like a great many people will be forgoing computers in favour of running their lives and businesses from their smartphones and tablets in the not too distant future. But don’t tell the good people at Apple – that might scupper their plans to bowl us over with the inevitable next generation of Macbook.